And the Award Goes to…WritingCity! According to research and the National Council of Teachers of English, discipline-based instruction in reading and writing enhances student achievement in all subjects and is essential to learning. Sometimes teachers hesitate to include writing assignments in all core subjects because they fear having stacks of additional papers to correct. That does not have to happen. Here are some Valentine’s Day ideas to incorporate writing in all content areas without adding to your workload. Have fun! Share your ideas with us on Facebook or Twitter! Show students how to check their pulse and then record this information. Ask students to do jumping jacks for 1 minute and then check/record their pulse again. Wait 1 minute and have students record their pulse a final time. Assign students to record their findings on a bar graph and write about what they learned from this heart rate activity. For example, how much faster does their heart beat when they are active? What happens when they rest? Ask students to compose a short diary entry written by a fictional person living in ____(fill in the year that is being studied in class) who just received a valentine from a friend. Encourage them to include information such as: where the narrator lives, what that person does on most days (job, school, housework, etc. ), and what the valentine looks like. Complete a Valentine’s Day science experiment: create sparkly red Valentine’s Day slime, dissolve candy hearts, etc. Click here to see these and some other engaging STEM ideas! 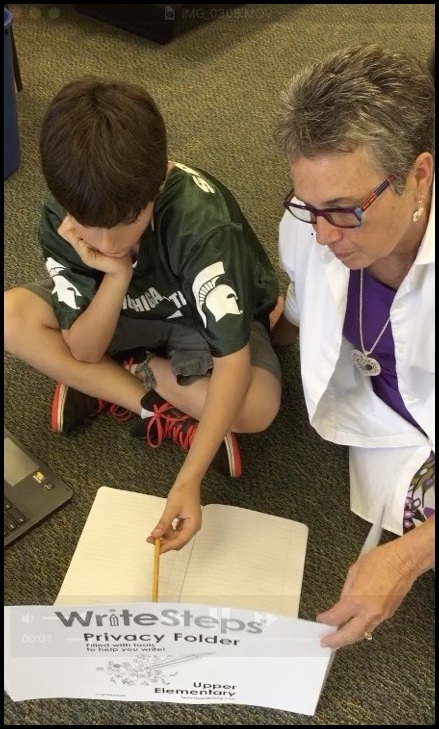 Once the experiments are complete, have students summarize their findings or write a “How To” explaining the procedures so that someone else could complete the experiment. Terrie Morrow, a 4th grade teacher at Dutton Elementary School in Caledonia, Michigan, is this month’s featured teacher. Terrie is new to WriteSteps and has never felt more confident teaching writing than she does with eWriteSteps! Terrie: I am thrilled to find all of the materials right at my fingertips and am delighted in the sequential and sensible order of the lesson plans. CaptivationStation has been a benefit to teaching and to learning. I benefit as a teacher because of the time-saving lessons and materials that are already provided. My students benefit as writers because of the lessons, the examples, and the ability to work, talk, edit, and revise together. WriteSteps: What advice would you give to a teacher who is new to WriteSteps? Terrie: Fire up and turn them loose! Don’t be afraid to get started and don’t be afraid to learn along with your students. You can always make adjustments as you see the need for them. Writing is not my strength. WriteSteps is equipping me as a teacher, and I don’t even have to leave my classroom for the professional development training. I love that I can learn right along with my kiddos. WriteSteps: What is the reaction of your students? Terrie: The most common request I hear from my students is, “Can I work on my writing piece?” Another question I hear often is, “Can I share my writing piece with the class?” They are not afraid of the struggle; they are not afraid to share their work; they are not afraid to get peer support, and they often ask about staying in for recess to work on writing pieces. WriteSteps: Tell me about your biggest student success story since using WriteSteps. Terrie: First, I love watching my students gather together in groups to talk about their writing pieces. Students are self-directed and gather together on their own. They coach each other with revising, editing, and publishing their pieces. Another success story is with a student who HATES writing. I have had these kiddos for two years, and writing has always been physically challenging for this little guy. Early into the WriteSteps lessons, he wrote one of his best pieces. It was written with depth, clarity, and with a neatness that appeared to be grade level work. He was proud to read it aloud to the class, and his classmates complimented him honestly and specifically. And the Award Goes to…WriteSteps! WriteSteps just received yet another award! We were chosen by Educents as one of the top 101 Educational Websites of 2017. There’s so much more on our website than lesson plans! Explore, and you’ll find our blog, eNewsletter archives, Professional Development options, press releases, and more! Already using blended learning? Reluctant to start? Regardless, join our Blended Learning Specialist, Joanna Van Raden, as she shares her favorite tools to save you valuable time while teaching writing. You’ll leave this webinar feeling ready to start blending your writer’s workshop! Can’t make it? Register anyway, and we will send you a link to view the recording. WriteSteps is looking for an energetic Inside Sales Representative to develop new prospects and interact with existing customers to increase sales and to become the newest member of our virtual family! 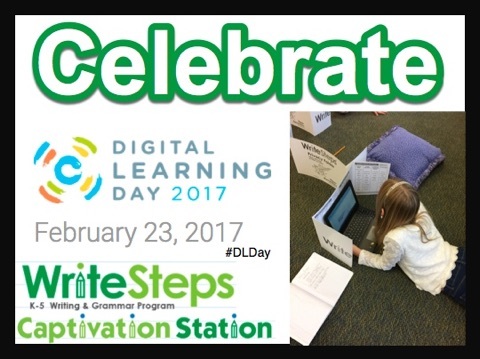 Celebrate Digital Learning Day with WriteSteps! Show us on Twitter how you and your students are using digital writing tools. Use #DLDay and tag @WriteSteps_. (Don’t forget the underscore!) You’ll be entered into a drawing to win a set of posters or privacy folders…your choice! Looking for some new ideas to try? Joanna Van Raden, our Blended Learning Consultant, loves Padlet, S’more, Adobe Spark, and Typorama. 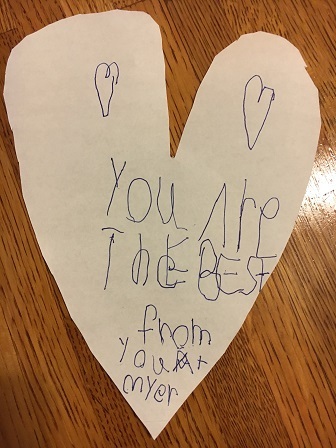 We enjoyed this Valentine’s Day message from a kindergarten “admirer”. California here we come! National Presenter, Kim Gates, will be at the National Title I Conference in Long Beach, CA. Stop by Booth 446 to learn more about WriteSteps, Captivators, and CaptivationStation! Joanna Van Raden, Blended Learning Specialist, will be presenting at the Michigan Reading Association Conference. Join her for her “Blend Your Writer’s Workshop: Personalize, Motivate, Create!” presentation. Also, sign up to see Herman Humes present “Writing Responses: Read, Reread, React.” Don’t forget to stop by Booth 83 to meet our presenters and learn about our new digital writing platform, CaptivationStation. Principal, Kimberley Rodriguez, will be presenting Balance: Teaching and Testing at the MAESP conference. Stop by our booth to visit with Ben Kutz learn about our blended learning instruction and practice platform, CaptivationStation! Stop by and see us at the MACUL Conference. Herman Humes will be at Booth 339 to answer all of your questions! Joanna Van Raden, MACUL’s 2015 Teacher of the Year, will be presenting on the Blended Writer’s Workshop. Visit Booth 519 at the Computer Using Educators Conference. National Presenter and Exhibitor, Kim Gates, will be there to answer any questions you have about WriteSteps and CaptivationStation!